I'm writing this post because I wanted to look at that dress – a wondrous mix of midnight blues sparkling and shimmering over the body like the summer ocean at night under a full moon. And notice the slouchy low pockets which add a casual ease to an incredibly expensive dress. This dress is a simple shape which follows the lines of the body but glitters with sublime color and decoration – just beautiful. Karl Lagerfeld presented the Chanel Spring-Summer 2012 Haute Couture collection in Paris this week. The entire collection was in shades of blue which is my favorite color. Additionally, the show was presented at the Grand Palais in a set which had been specially built to represent the inside of a...wait for it...luxury airliner. The airliner was made out of anodized aluminum and took five days to build inside the Grand Palais. The interior included 250 first class seats. A drinks cart circulated and fake clouds floated by the windows. 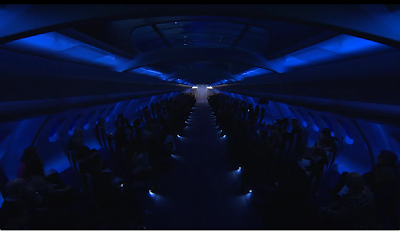 At the end of the show, Lagerfeld, who turns 79 this year, emerged from the cockpit which was complete with glowing dials. I mean really, that sounds like a lot of fun. This looks like a dress that Coco Chanel herself wore. The stones on the dress below glow with a greenish tinge. Lagerfeld told a journalist that he wanted the low pockets to look "like boys whose jeans are falling off." I love the idea of bringing that boyish attitude into the couture. It's what you call French insouciance. Gumball-size stones decorate this short dress. Chanel has been mounting recently some amazing fashion shows in the Grand Palais. For the Spring-Summer 2012 ready-to-wear collection, the all white collection was set "under the sea." Models who had pearls on their face and in their hair, walked past giant white choral, and English sensation Florence Welch emerged from a big clam shell to sing her hit "What the Water Gave Me." Click on the image below to watch the entire couture show. Don't miss Karl emerging from the cockpit at the end. After, click on Fashion Shows to watch other Chanel shows including the Spring-Summer ready-to-wear with the performance by Florence Welch. Don't you love the internet?